You were always considered the one who has magical fingers, good at craft , superb at art and even better at embroidery and then as you grew up you found lesser and lesser time to make use of this talent that you are blessed with, till the day you come across this fabulous saree clad person who stumped you with the utter gorgeousness of what she was wearing! 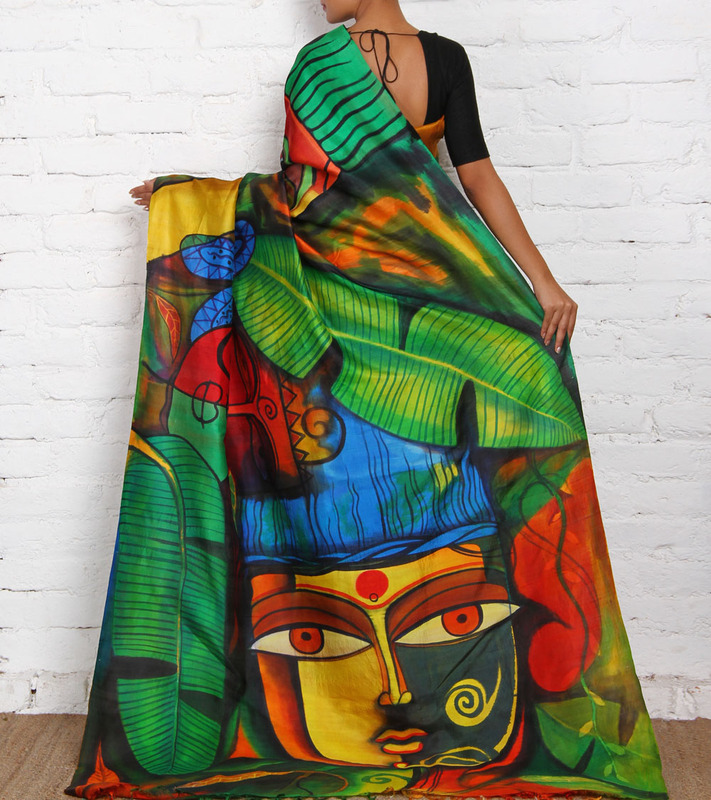 Yes, a hand painted saree, the kind that can put artistry on canvas to shame; the kind that simply makes each saree a work of art and bestows so much value to a simple piece of cloth and turns it into so much more. 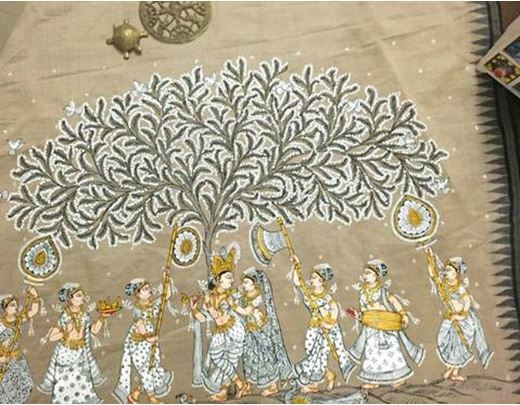 Painting on fabrics for the sake of art has been an ancient tradition but sarees were either woven or embroidered, which makes saree painting a rather modern innovation. However while this was a happy marriage for a new kind of fashion, there is a huge shift in focus to tradition. 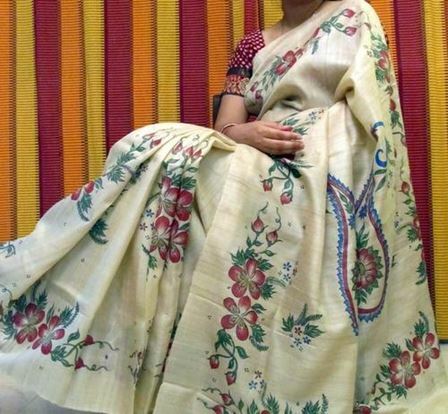 In fact most of the fabric art that you see on sarees is heavy on traditional art with forms like Madhubani, Kalamkari , Mural art, and even tribal art like Warli. It is no longer rare to come across Kalighata painting replicas on Bengal cottons and to see how well the merging takes place. 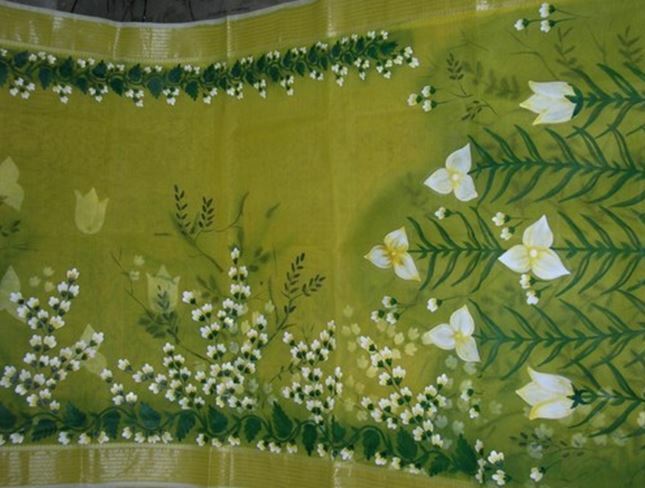 So what would be the best way to begin this project of hand painting of sarees and is this such an impossibility? A wooden board with adequate width to allow the stretching of the material or a round embroidery frame in larger size so as to stretch a larger area of the fabric. Tracing material if one is wanting to trace a design. Basic set of brushes that have round tip, flat tip, thin tipped and also outlining pens. Mixing palette in case you wish to mix some colors. Which are the most suited fabrics? Well right from cotton to silks, tussars and crepes are all greatly suited to your artwork, but the most important ingredients being the ability to judge what you can try and get right-begin with something slightly easier rather than jumping straightaway into the fray with something as tough as mural art or something needing typical knowledge of forms such as tribal art. It is always more prudent to go for floral or abstracts for which you may have already gained some expertise on normal paper. Here the same artistry has to be applied with the exception that you would soon be wearing that art instead of admiring it on a wall! 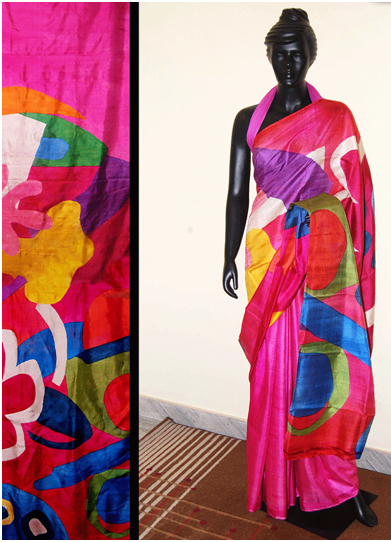 A Major Tip-Do wash the saree and iron it to remove creases before you begin work. Be discrete in your choice of design and color combination keeping in mind also the base color of the saree-it’s always a good idea to begin with an off white saree or pale colored one as the change in the color effect is only seen after application on the fabric. How a design with its colors might seem on blue backdrop may not be in any other-so initially stick to white and cream colors. Here are some of the sassiest choices you could begin with right away for trying out your basic saree painting project. 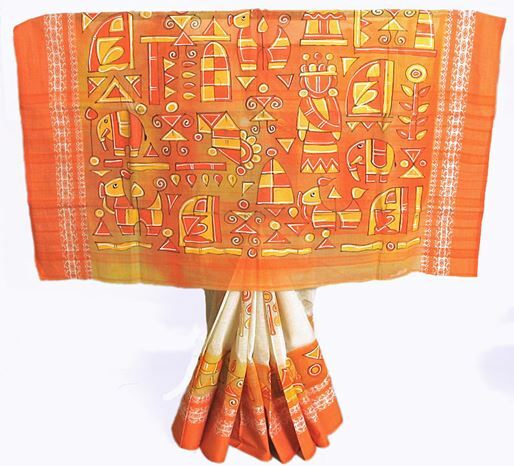 The saree below heavily relies on tribal ethnic art that is popular in Bengal and has earthy colors and hues though they are not shy to use brighter more chic colors nowadays. The pallu has been heavily worked on and the main body of the saree has a repeated figure or design that runs through the entire length. To begin with, this is a simple color family-amber, orange, yellow and white. You may have noted that it is on a backdrop of a color wash that the images have been expertly painted. 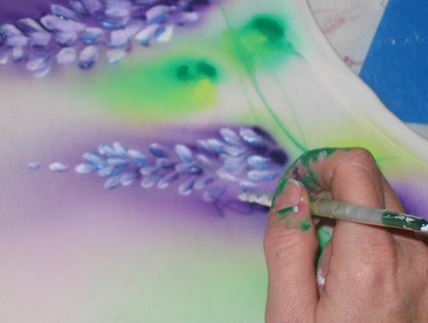 Here is a clever way to begin a hand painted saree project. Pick a saree that already has appliqué work done on it. All that is needed to be done is make similar designs along the border or the spaces that are not filled with appliqué. 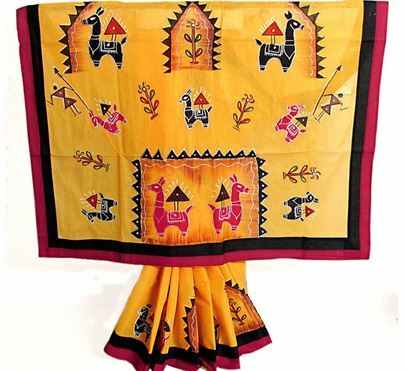 You can see the Bankura horse and the little zig zag border that has been given to the feature where the appliqué has been applied to the saree. 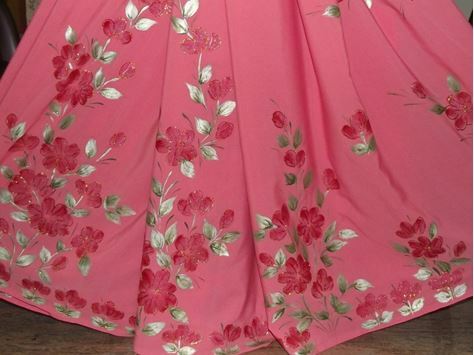 Who doesn’t like the brush of pure chiffon or georgette on the skin on hot summer days and what better way to enhance a plain chiffon saree than by adding a floral design that is truly uplifting in its effect on the look. Here a simple rose has been taken several notches higher in its look with the usage of shading along with different hues of pink and the usage of white to create the petal folds. There are many who use sponge for making flowers. Choose a flower you love, be it peony, lotus or camellia and see what wonder you can create with your brush. Point to note please do remember to match the right kind of shape with the right flower-as in this piece; the roses have rose leaves matched to perfection. 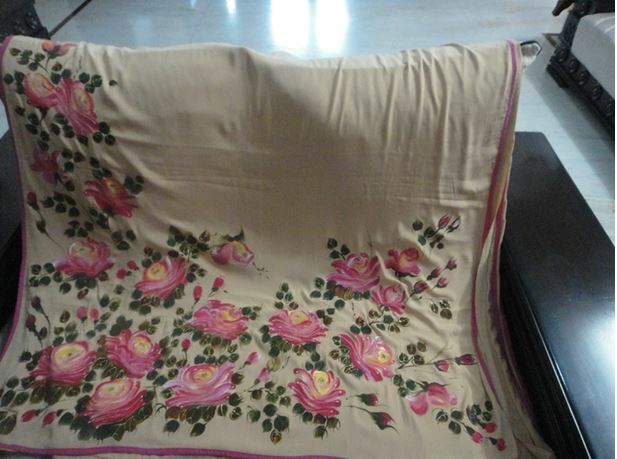 Here’ the look at a beginner’s work on kota cotton saree with floral design that matches beautifully with the border in pink-that is smart coordination! If you wish to go the distance and try something truly novel-here is one saree that will be amazing in its final outcome. The fabric is tissue and one could use kota cotton as well. There can be few who can match the mastery of kalamkari when it comes to the ancient art of fabric painting and when this is executed on cottons or silk sarees, the magic is seen to be believed. 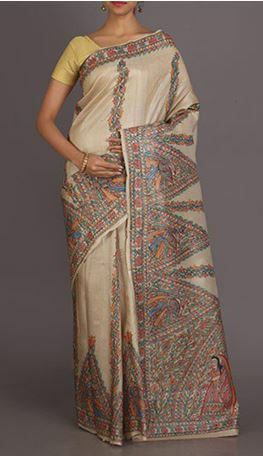 This raw silk saree with its vegetable dye hand painted kalamkari is inspirational for one to try ones hand at replicating such design-begin with simple motifs and then take that ahead. 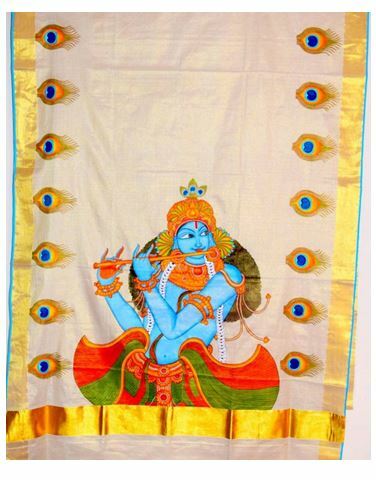 Another classic from the south, the mural painting that began from the kingly state of Travancore in Kerala has reached its most fashionable high with murals making a splash on the ramp internationally as well as more and more demand from local artists who have begun taking in huge orders from across the globe from expat Indians demanding this style of art on sarees. 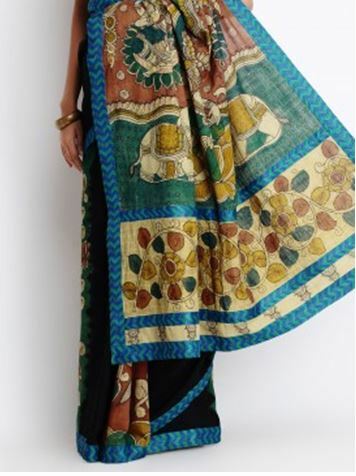 Pattachitra from Odisha too has found its way on to the sarees with gorgeous detailing and here the Raslila can be seen drawn and painted with such intricacy on the raw silk Bapta saree. The details in white are outstanding especially in the backdrop of colors as muted as this. 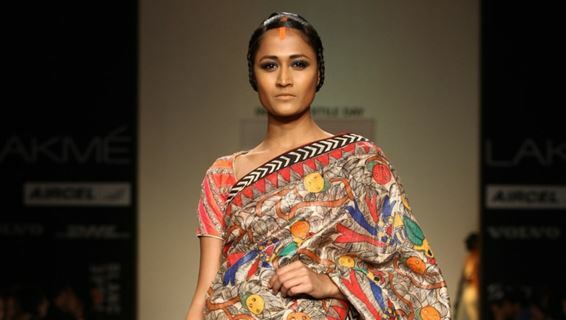 The Mithila art called Madhubani –that tells stories from the Ramayana, is a staple on sarees today with an upsurge of fabric art sarees going more popular with the passage of time. Plain wooden brushes are used with colors made with organic material. 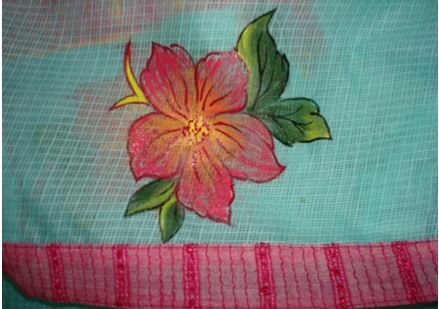 You can see one example of art all over the saree and in another the delicate work done to create a border and the pallu.